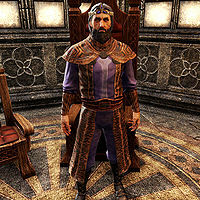 High King Emeric is the King of Wayrest and the leader of the Daggerfall Covenant. He first forged an alliance with the kingdom of Sentinel, in part by marrying Maraya, the daughter of King Fahara'jad. He later convinced many Orc tribes to join the Covenant by promising to aid in the restoration of Orsinium. He leads the Covenant from its capital city of Wayrest, and is protected by the Breton Lion Guard. Pursuing the Shard: Head to Wayrest to inform High King Emeric of the theft from the Abbey. Another Omen: Warn High King Emeric of the emergent threat in Gavaudon. Vaermina's Gambit: Face the Night Terror and end the threat to Stormhaven. The Road to Rivenspire: Head to Rivenspire on the order of High King Emeric and assess the situation between the noble houses. Rendezvous at the Pass: Meet the Lion Guard at the pass on the other side of Ephesus. Storming the Garrison: Help the Lion Guard and the Knights of Saint Pelin reclaim Bangkorai Garrison. Striking Back: Make preparations to liberate Southern Bangkorai from Imperial control. Trials and Tribulations: Find out what the Imperial Magus-General is planning. To Walk on Far Shores: Enter the afterlife and defeat Septima Tharn. Messages Across Tamriel: Help the Great Mage set up an All-Banners meeting in a neutral location. "You know, there was a time when I was young when I thought being a king would just be a barrel of laughs. The coin, the power of all its trappings—it looked like such fun. It's not, though. If I don't escape these stone walls soon, I'll go mad." High King Emeric: "This crown makes me look stupid. It sits on my ears. My ears are not my best feature." Queen Maraya: "I like the way your crown looks. If you just put it a little straighter, it'll fit perfectly on that perfect little head of yours." Queen Maraya: "Darling, how does this dress look? I'm not too thin, am I? Please be honest with me." High King Emeric: "No, no ... I think you look wonderful, and very thin ... very skeletal, which is why I like ... skeletal. Your jewelry hangs cute." After coming from the Pariah Abbey, you can bring the king the news. "Ah! You've come from Pariah Abbey, haven't you? Don't worry about giving me the bad news. I'm already expecting the worst." The Dream Shard has been stolen by the Midnight Union. "Really? I heard rumors of chaos at the Abbey, but I had hoped they weren't true. The Midnight Union's never really been a problem, I mean sure, they engage in a little smuggling and gambling, but this...it just doesn't make sense." "Well. We need to go straight to the source. The midnight Union does nothing without the approval of Count Hosni at-Tura. I can't imagine him being behind this, but one never knows. Hosni has a walled estate on the shore to the west of here." "Strangely enough, the man has apparently chosen this same time to have a betrothal celebration, and I happen to have an invitation I won't be using. Go in my stead and talk to Hosni. Find out if he knows anything about the Dream Shard." "Either Hosni's trying to ruin my reign, or there's something seriously wrong with the man. If you'll snoop around his estate, we just might figure this thing out." After dealing with the situation with Hosni at-Tura and return the Dream Shard to its' rightful place, you can return to King Emeric with the warning about a second Omen. "Welcome back to Wayrest. It's good to see you again. Do you have the news? To be honest, this whole matter with the Dream Shard has robbed me of a few nights' sleep. I'll be a royal grump if we can't get this matter resolved soon." The Dream Shard has been returned to Pariah Abbey, Your Majesty. "Well. There we go then. That wasn't so bad as Abbot Durak made it sound. I'm sure he had his reasons though. What about the Daedra, the "Omen" that was behind all this? I trust it's dead, or gone?" Yes, but Abbot Durak believes there's another Omen in Gavaudon. "Gavaudon? Why couldn't it be in Morrowind or somewhere else across the continent? Gods. We already have enough trouble in Gavaudon. General Godrun says the Ironhand ogres are far from being fully defeated." Abbot Durak asked me to join him in Gavaudon. "Well that's good at least. You two are the experts, though I suppose that's a dubious honor. If there is an Omen in Gavaudon, I'm guessing it's similarly disguised> Godrun didn't report anything suspicious but maybe it's worth asking Captain Ernele. Should I seek him out then? "Yes. Ernele was fighting with Godrun, but he's just been reassigned to shore up our defenses here in Wayrest. It may be a wild guar chase, but it's worth asking Ernele if he saw any signs of Daedric influence in Gavaudon." Then I will go speak with him. "I won't hold you up any longer. As much as I enjoy your conversation, I think the situation in Gavaudon takes priority." "He's the best damn general in the Daggerfall Covenant, if you ask me, and he's a good friend. His army came to our defense against the Ironhand ogres. They've fought hard, but the battle's not over. Godrun's headed back to Shinji's Scarp even now." While trapped in his dream, Emeric is tormented by his nightmares of betrayal, loss and failure. General Godrun: "The Daggerfall Covenant needs a stronger ruler, Emeric. Your reign as High King has come to an end. I'm taking Wayrest." High King Emeric: "Damn it, Godrun. We've been friends for years...! How can you just betray me like this?" "Queen Maraya: "I rue the day my father gave you my hand in marriage. You're not worthy of being my husband, and you're certainly not worthy of being my king!" High King Emeric: "Maraya … I don't understand. I know we wed for political reasons, but I thought that over the years you actually came to … I thought you loved me. If I've lost your support, then I have lost everything." High King Emeric: "Tell me quickly and truthfully. How do we fare?" Guard Captain: "Orc troops have broken through the gates, Your Majesty. They're heading toward the castle." Guard Captain: "The Supernal Dreamers are sacrificing people in the streets. Your Majesty … what should we do?" Once arriving in the Market Square at the Guillotine, Emeric can be found with a condemned prisoner who looks very familiar. The King can asked about the prisoner and his crimes. "The prisoner must pay for his crimes. It is the only way to restore order to the kingdom." What are the prisoner's crimes? "Treason. His actions would have destroyed the Daggerfall Covenant. He has been found unworthy in every way. He deserves to die." You don't sound like King Emeric. "But I am King Emeric—the new King Emeric. The unworthy weakling will be gone, and I will take his place." I'm not going to let you do that. After the ruse has been revealed, the true King Emeric can be spoken to, though he is reluctant to wake up. "Why did you make him leave? I was this close to reaching the peace of death! It has just been a jest—the Daggerfall Covenant, my kingdom, my life. I was never worthy to be king. I'll did here and one more worthy will take my place." This is a dream, Your Majesty. "No. I wish that were true, it was the other life that was a dream. All that business about the Daggerfall Covenant was just a pack of lies. This is reality. Fear. Bloodlust. Betrayal. In my heart, I think I always knew that." Please, just trust me. We need to leave. "No. I'm not falling for that again. A million times he's shown me. To hope is to suffer. Why don't you just kill me, and have done with it? Tell Galthis to come back. He can take me. Just end this nightmare!" You know where he went. My castle. His castle now. His damn minions hold the keys. The Knight. The Thief. The General. If you're not going to kill me, please just … go away." After he has told you about the keys, he decides it is not worth speaking anymore. "What's the point of opening my mouth to speak? There's nothing I can say to end this torment, so I'm just going to stop talking. I mean it." Once Galthis is killed, King Emeric is more himself. "What in Oblivion just happened? Something changed. It's going to be bad, isn't it? It always is. I don't know why I bother asking. Still. I seem to remember you, but...this is just another trick, isn't it?" It's not a trick. Galthis is dead. "Dead? Truly? So … I can still be Emeric? I can still be High King? I don't know I deserve that at this point, but … I guess it's a good king. Yes. My binds are actually loosening, and that is very good. Does this mean … ?" After waking up from Emeric's Dream, he will be waiting to speak with you in his bedroom. "I asked Abbot Durak to go downstairs because I wanted to speak with you for a few moments alone. Tell me something. Do you recall everything that happened in the dream?" "Frankly, I wish your memory was as hazy as mine. What I do recall, I'm rather ashamed of. I am the King of Stormhaven, the High King of the Daggerfall Covenant, but that damn Daedra reduced me to a pathetic child …. I'm just glad you're safe now. "I am too, and I owe you for that. And more, really. You were the one who acted nobly in there. Not me. You had enough courage for both of us. I was broken—you saw me. I can only hope this experience will make me a stronger, a better king." You're being too hard on yourself, Your Majesty. I hope it will too, Your Majesty. "Indeed. for the sake of Stormhaven and for the sake of the Daggerfall Covenant as a whole. Enough dreary talk though. The good news is that Vaermina and her Daedra are gone. Come with me to the throne room." Once back in the throne room, Emeric wishes to thank you in front of the gathered audience. "There is no suitable reward for what you've done. Sorry to say it, but your success has probably earned you more responsibility than reward. You'll be hearing from me again sooner than you'd like. I apologize in advance." No need to apologize. I'm always ready to help. "Bah! Are you always so damn noble? You need to lighten up, my friend. Perhaps this will lighten your spirits. It's a small token of my appreciation, but one I hope will serve you as you have served me. You're a hero … and now, a friend too." King Emeric will have a request of you to do some traveling. "Speaking to you now as a friend, and as your king, I wonder if I might prevail upon you to assist me with some other matters. One that is a matter of state, and another that is of a more … personal nature." "Rivenspire is the real problem. The quibbling between the noble houses there seems to have turned bloody. I would send you with my authority to try to restore order. I will join you when I can." I will go try to the problem in Rivenspire then. "And then there's the personal matter—that damn guillotine. For reasons you might recall, I want it demolished. I've given the order to Captain Ernele, but on your way out of Wayrest, I would ask that you ensure it's being done thoroughly." Of course, Your Majesty. I understand completely. "Your help with both these matters is much appreciated. Until that damn guillotine's been dismantled, I won't be able to sleep. And more importantly, until the matter in Rivenspire is resolved, the Covenant will be severely weakened." Can you tell me any more about the situation in Rivenspire? "Honestly, I deserve some of the blame for Rivenspire's troubles myself. After Ranser's war, I didn't trust any of the nobles enough to give them the throne, so I appointed three houses to share rule of the kingdom. Seemed like a smart strategy." Now the nobles are fighting each other? "So it seems. Maraya actually counseled me to appoint a single ruler in Rivenspire more than a year ago. I should've listened, but after the mess with Ranser … there's something about nearly having my head on a pike that's hard to forget." You were nearly killed in Ranser's War? "Well yes. My decision to marry Maraya instead of King Ranser's daughter really stuck in the man's craw. He had Wayrest surrounded at one point. I remember—I even dreamt about my head on a pike. Of course, as you know, I've had worse nightmares." Emeric will travel to Shornhelm alongside his wife to oversee the current crisis and he can be spoken with in Shornhelm Castle. "Here we have the savior of Shornhelm, I presume? You should know that Baron Dorell and Countess Tamrith have been quite generous in their praise of you. I trust you were able to close this portal Montclair was using to bring in reinforcements?" Yes. Vernadis Ravenwatch was with me and he closed the portal. "I'm not surprised. Verandis and I go back many years. He has a habit of making people nervous, but I've been trying to reassure Baron Dorell and Countess Tamrith—he is loyal to the people of Rivenspire. Did you also defeat this … Reezal-Jul? "Hmm. Then I suppose we'll have to track him down, he and Montclair both. I fear Montclair's ambitions may be far greater than simply conquering all of Rivenspire. It's better we stop him now." I'll help you however I can, Your Majesty. "Thanks to you, we have an excellent start here in Shornhelm, and I will devote my resources to fortifying the city as quickly as possible. We're secure here now and we have to ensure it remains that way." "Shornhelm may be secure, but reports from other parts of the kingdom suggest Montclair is stirring up trouble everywhere. Countess Tamrith and Baron Dorell will each take a detachment of the Shornhelm Guard and go investigate these reports." "As you might have guessed, I'm thinking you are best-suited for tracking down Reezal-Jul and making sure he doesn't go opening any more portals into Shornhelm. Did Vernadis perhaps mention any suspicions of where this rat may have scurried off to?" Verandis was going to investigate the matter himself. "Then I suggest you join him. Knowing Verandis, he returned to Ravenwatch Castle to study whatever evidence he may have found. You'll find it west of the city, near the town of Crestshade. I'm counting on the two of you to stop Reezal-Jul, and soon." I'll go to Ravenwatch Castle right away. King Emeric can be further questioned. "I should warn you. Ravenwatch Castle is as strange as the man who owns it. His family is very old, and they have...strange traditions. Don't worry, though. I have no doubt about the fact that he is on our side. You may rely on anything he says." Can I ask a few questions before I leave? "Of course. I am a veritable treasure trove of useless information, and I love to share." How do you know Verandis? "I've known Count Ravenwatch since I was a boy. My father even sent me to study with him for a time. House Ravenwatch is one of the oldest noble houses of Rivenspire. Quite a legacy, and Verandis carries it well." There must be more to it than that. "Well, if you must know, he's part of the reason I'm wearing this crown. When I first proposed to form the Covenant, many people opposed me. Verandis, however, without any urging, supported my plans and helped sway opinions in my favor." "I think he did it because he was tired of bloodshed and he knew he could trust me to always work toward peace. If I can end this conflict and restore it here, I will consider my debt to Verandis paid in full." How long will you remain in Shornhelm? "As long as it takes. I knew that having the noble houses share the throne wouldn't last. I should've chosen one of them to rule years ago. To be honest, I feel I'm partly to blame for all of this, and it's my duty to be here and see it resolved." Why didn't you bring an army? "The last time I brought an army to Rivenspire, it was to put an end to Ranser's War. That isn't a memory I want to reawaken in this region. Besides, it will be better for all concerned if Rivenspire resolves its own problems." Has there been any word from the west? "Rumors and wild tales, for the most part. We did receive at dispatch from a Captain Janeve. Apparently, something occurred in the town of Crestshade—something devastating enough to require the captain to set up a came for refugees." What can you tell me about Crestshade? "Very little. It's a small town at the foot of the western mountains. Since you're heading in that direction to see Verandis, perhaps you can look in on Crestshade? I'd be grateful if you can determine what actually happened out there." "Countess Tamrith has returned from the west. She is understandably distraught, but grateful to you all the same. Verandis passed through here as well, on his way to the Lorkrata hills. I believe he was expecting to (sic) to join him." After the defeat of Montclair and the Lightless Remnant, King Emeric will have to decide who to crown as ruler of Rivenspire, and asks for your imput input into the decision. "So here we are. Baron Monclair's dead and that damn artifact is destroyed. Yes. You can part yourself on the back all right. You've saved Rivenspire and that's no small thing. You do realize this creates a predicament for me, though, don't you?" "Well, I can't very well go on pretending the nobles can share the throne. Everyone knows what a colossal mistake I made there. I'm going to have to crown someone—a king or a queen of Shornhelm, someone to rule Rivenspire, don't you think?" It does look like the people are expecting that. "Exactly. So I have to choose. Countess Tamrith or Baron Dorell. Frankly, since you've recently fought alongside the two of them, I would appreciate your counsel. Speak to them if you wish, think about it, and then give me your recommendation." "Take as much time as you like, my friend. It's only the High King and the entire kingdom of Rivenspire waiting." I'm ready to give you my recommendation. "Good. Though I do hope you've given the matter due consideration. This isn't like choosing which tunic to wear in the morning. It will affect many lives and the future of the Daggerfall Covenant. Tell me then. House Tamrith or House Dorell?" "If that's your counsel, then I will make Baron Dorell King of Shornhelm. Are you certain though that this is the wisest course?" "The brave Baron Dorell, then. I know he is a valiant warrior, and I expect he will make a wise and honorable king. King Alard of Shornhelm. It even has a nice ring to it." I think King Alard will be an excellent ruler. "Then it's decided. Thank you for your counsel. Both King Alard and myself will be in your debt. After all you've done, there's no reward that can express my gratitude, but please accept this gift. I'd feel guilty if I didn't give you something." No. I really think Countess Tamrith should rule. Actually, I'm still considering my decision. "Very well. Don't take too long though. We don't want anyone passing out from standing on their feet too long." High King Emeric: "If I might have everyone's attention. I have decided to crown a new King of Shornhelm...Alard Dorell, please come forward." High King Emeric: "I hereby name your house the new royal house of Shornhelm." King Alard: "I give you my solemn oath, Your Majesty. I will lead the Kingdom of Shornhelm with wisdom and honor, and I pledge my eternal allegiance to you and to the Daggerfall Covenant." High King Emeric: "All hail! The new ruler of Rivenspire!" After the new ruler has been crowned, Emeric will go stand beside his wife. "You realize that since I made this decision based on your recommendation, that if ever there's a rebellion in Rivenspire...well, you'll at least have to help me clean it up." Emeric arrives in Bangkorai to help his cousin. 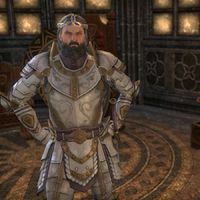 Once The Parley is completed, King Emeric will arrive in Evermore Castle along with his Lion Guard, to assist his cousin, Queen Arzhela in fighting off the Imperials. High King Emeric: "Fortunately, you won't have to." Queen Arzhela: "Emeric … I mean, Your Majesty! Thank the gods!" King Emeric can be spoken to ask what he is doing in Evermore. "I've just been informed of what's happened at Bangkorai Garrison. It seems my timing is impeccable as ever. So you're the one who's been helping my cousin Arzhela hold the kingdom together?" I've helped however I could, Your Majesty. "Of course, and now you'll have some help. I've brought as many Lion Guard as I could muster. We were hoping to spill some Reachman blood for old times' sake, but the Imperials will suffice. Are you ready to take the garrison then?" Of course. I'm yours to command. "Excellent. I'll organize our forces and march to Bangkorai Pass within the hour. I've already sent scouts to assess the Imperials' defenses. If you get there before me, look for Scout Nadira. We can finalize our plans when we're all there." I'll look for Scout Nadira at Bangkorai Pass. Upon arriving at the Bangkorai Garrison, you will find King Emeric, Queen Arzhela and their soldiers have arrived before you and King Emeric has come up with a plan to gain entry. "There you are. If you expected to find us scaling the walls already, I'm sorry to disappoint. Don't get me wrong...we considered taking a stab at it, but with our...limited numbers, I don't really think that plays to our strengths." What strengths are you referring to? "Well, let's see, we have this sewer entrance here that the Imperials don't seem to know about, and then...well, we have you, of course. I'm thinking to base our attack strategy around that. What do you say?" You want me to go in through the sewers? "Yes. Sometimes victory means getting dirty, and that's quite literally true here. A passage in the sewers leads to the gatehouse. If you'll open the main gate, we can get into the garrison without having to scale the walls and lose half our men." I'll go in and open the gate then. "Just so you know, while you're slogging through sewage, we won't be napping out here. We'll go ahead and assault the main gate. It'll create a good distraction. It'll also mean that if you fail, we'll all die. Just so you know." Will you be leading the assault? "Unless the gods decide to strike me down before the battle starts. I've had enough standing around in throne rooms, talking about fighting the Imperials. I miss the satisfaction of sliding a sword between the plates of an enemy's armor." Queen Arzhela will be fighting too? Of course! Battle runs in our blood. You think our family rose to royal power by attending teas, playing games at court, and currying favor with the right nobles? No. This king and queen work...at its heart, it's a bloody business." What's the plan once we're all inside? "I haven't neglected that. I've looked at the garrison's layout and whatnot, and it'll really depend on what we find in there. I am confident we'll catch them off-guard. So no matter what, we'll have to capitalize on that." How did the garrison fall to the Imperials in the first place? "The sad truth is we're not even sure. More than two hundred Knights of Saint Pelin were stationed here, but only a handful escaped. Their stories are all over the place. Giant Daedra scaling the walls, the dead rising from the crypt … who knows." Was Magus-General Septima Tharn involved? "That old witch was undoubtedly the mastermind. And actually one of the knights who escaped claimed Septima snuck into the garrison posing as a Redguard refugee, and then unleashed Oblivion the next night. Knowing her, that's quite possible." "Yes. I met her once, back before the Soulburst. I'm ashamed to admit I actually fancied the girl. She was as cold as a Nordic winter of course. I wonder if she's still attractive though? Regardless, I think her head would look best on a pole." After traversing the sewers to the gatehouse and opening the gate, Emeric will be found outside, shouting orders. High King Emeric: "Keep Pushing! Drive the bastards back or put them down!" "I quite forgot how it feels. The rush of blood to the head; the sound and fury of battle! So what if I've put on a few years? This is where I belong. I'm going to take back this garrison or die trying." I'm with you. What do we do next? "I've captured a few keeps in my day, and I learned the hard way: whoever holds the courtyard, holds the keep. So I'm going to seal our grip on this space. We should also hit the barracks though...before the Imperials get their greaves on." You want me to attack the barracks? "Yes, but I'm not saying to slaughter a bunch of half-dressed soldiers. We're not Reachmen, for Mara's sake. No. I'm hoping some of our knights are imprisoned there and you can free them. We need all the swords we can get." I'll go to the barracks and free any prisoners I find then. "After we've got the courtyard under control, we'll meet you up there. Oh! And if you see Septima Tharn or any of her commanders, feel free to take them down. I'd love to kill the old witch myself, but you're better qualified." If I get the opportunity, I'll take it. After storming the barracks, freeing the prisoners and killing Commander Attius, King Emeric will be found outside. "It's a damn good thing you came out. I was just about to charge in there and find you myself. If I had died, it would've been your fault. You don't want the death of a king on your head, do you?" "Gods! I probably shouldn't jest like that, not around Arzhela. Poor thing. There's no telling what these twisted Imperial bastards might have done with King Eamond's corpse. He was about to be entombed here when the garrison fell, of course." Where exactly was he to be entombed? "The royal crypt. All of Bangkorai's rulers are buried there … to keep eternal vigil and such. The Imperials are doing something horrific in there; it's where they've formed their last line of defense. Whatever they're doing, I need you to stop them." I can handle that. Where is the royal crypt? "East. Across the bridge behind me. They're just throwing conscripts at us to keep us from getting across. They'll run out of fodder eventually, but if you'll lead the charge across on your way to the crypt, we can take the bridge now." "We're coming right behind you. I promise. But you better clear the path. I needn't remind you that you don't want my death on your head. It would haunt you for the rest of your days." Despite killing Battlemage Papus, he still managed to summon a Dark Anchor straight into the garrison. King Emeric and Queen Arzhela will be outside the crypt, looking down at the anchor. "When you went below into the crypts this foul icy fog rolled in. The earth shook and those Dolmen emerged from the ground beneath our feet. We retreated here to await your return, the rest you can clearly see." "I'm afraid the "giant Daedric anchors from the sky" issue is more your speciality(sic) than my own. I'll let you lead on this one." That doesn't seem very kingly. ""A wise leader knows how to delegate," my father used to say. He may have died in his cups, but the man knew his aphorisms. What could be more kingly?" Very well. I'll destroy the anchors. Once the Xivilai Moath is dead and the Dark Anchor destroyed, the garrison will be considered taken and King Emeric and Queen Arzhela will give a speech. High King Emeric: "With chains, they sought to bind this place in darkness and death … but the chains are broken! The garrison is ours!" "Mark my words—this victory will go down in the history books! This is the day the Empire began to crumble!" Queen Arzhela: "Knights of Saint Pelin! Many of your brothers and sisters died here, but this was the purchase of their sacrifice. Be grateful and be proud!" King Emeric will then lead his cousin outside the south gate. High King Emeric: "We have the bastards on the run now! Come Arzhela, come experience the joy of watching your enemies flee from battle." While outside, Emeric can be spoken to again, showing that he worked up an appetite. "Are you as hungry as I am? I'm completely famished. The thrill of battle does that, you know. And flirting with death makes food taste so much better too. We'll have to have a feast later. Yes, when the garrison's cleaned up." After speaking with Queen Arzhela, King Emeric will be eager to continue the campaign. "We gave the Imperials a healthy kick in the buttocks, didn't we? I bet they don't stop running until they're behind the walls of Hallin's Stand! We will have to go after them...of course." Why do we have to go after them? "For one thing, I still haven't seen Septima. I just have to find out how the years have treated the old girl. There's also the matter of liberating southern Bangkorai. It's Covenant territory, you know." How do you propose we liberate southern Bangkorai? "One grain of sand at a time, my friend. It's true we don't have the troops to go traipsing off into the desert, but one person can scout Hallin's Stand and see if Septima's there. If only I had a loyal and capable friend here …." All right. I can go to Hallin's Stand then. "Of course! You can go to Hallin's Stand! Fabulous idea! Yes, my friend. The key to driving the Imperials out of southern Bangkorai will be finding and...eliminating the Magus General. If you'll track Septima down, we'll be halfway done." What kind of place is Hallin's Stand? "It's a magnificent city right in the middle of nowhere; only the gods know why the Redguards even built it. But it's changed hands many times over the centuries. Not a subject to bring up when you have Fahara'jad and Arzhela in the same room." If we retake the city, who would get it? "Queen Arzhela, of course. It's part of Bangkorai. Come to think about it, I don't even know why Fahara'jad wants it. Doesn't he have enough desert cities? You'd think he'd be lobbying for more territory in the wetlands for Mara's sake." Can you tell me more about Septima Tharn? "Ah, sweet Septima. I may have mentioned before, I actually met her when I was just coming of age, tagging along with my father to Cyrodiil. I took quite a fancy to her, but she mocked my advances most cruelly." Why did she mock your advances? "My father was just a merchant lord from Cumberland, come to kiss the Emperor's ring—I didn't realize it, but I was hardly a match for a Tharn. Even back then, Abnur Tharn would never have allowed his niece to be courted by someone like me." What is the Imperials' strategy? "I believe they were aiming to conquer all Bangkorai, but we've shown them that's not going to happen. Septima's likely plotting revenge now, but who knows? Her family's so corrupt with power and necromancy, their motives hardly make sense anymore." King Emeric will have tracked Septima Tharn to the Hall of Heroes. He will be at the base of the stairs, speaking with his Lion Guard when he notices you and he will be pleased that finally made it. "I was wondering when you'd wander up! I knew you wouldn't let me get all the glory. Of course, I wouldn't have wanted to take any action until you were with us regardless, but I like to pretend. Anyhow, how in Oblivion are you?" I'm doing fine, Your Majesty. How are you? "I feel strong. I'm ready to spill some Imperial blood. This will be remembered as the place where the Imperials made their last stand in Bangkorai. Despite my advisors' concerns, I decided I had to be here and lead the charge myself." "Bah! Are you trying to coddle me now too? I command you—put aside your concerns. This isn't even going to be a real contest. Each of my soldiers can take ten of theirs, and you can take a hundred. So … can we get on with this?" Yes. Of course. I'm yours to command. He will then speak of his plan. High King Emeric: "All right everyone. This is it. No one is allowed to die until they're taken down at least a dozen enemies. Kill as may as you can. The only exception is the Magus-General—she's mine, and mine alone." Septima Tharn: "Good speech, Emeric. I can't believe you still fancy me after all these years. Let's get reacquainted then, shall we?" High King Emeric: "Overconfident as ever, I see! I'm not afraid of you, Septima …." Lion Guard: "To arms! Defend the King!" Septima Tharn: "You will not!" Septima Tharn: "I think we need to spend so alone time, Emeric. Come, let's find a quiet place …." After entering the Hall of Heroes and getting the blessings of the spirits there, you can enter the Chamber of Passage to find Septima holding King Emeric prisoner. As you approach things will take a turn for the worse. Septima Tharn: "Ah! Look Emeric, your saviour has arrived! Or is that our executioner?" After this, you can rush over to the King Emeric to see how he is. "It's good that you're here, my friend, though I'm afraid I may be dying …." Hold on. We can get you healed. "You're a good friend, courageous and loyal and all that … but you're a terrible liar. I … I … I just wish it wasn't that wench Septima that killed me …." King Emeric dies, a his soul drifts into the newly opened portal in the middle of the pool. 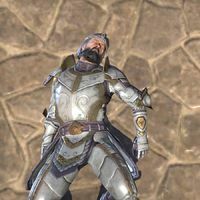 High King Emeric: "I suppose I must say goodbye, my friend. I'll see you on the other side …." When you enter the portal and the Far Shores, you will find Emeric's soul is still bound by Septima. He will notice you and call out. High King Emeric: "You're here too? Can you get us back? It's quite pleasant here, but I'm not ready to die yet! We can't let them win?" Septima Tharn: "Hust now, Emeric. Your death matters little—there are other kings. It's this one I wanted. The one who's been holding the Covenant together at every turn. The vestige from Coldharbour." Septima Tharn: "Didn't think I knew, did you? I did, and I knew I couldn't kill you … on Mundus. Here though, your'e severed from Coldharbour, from your soul. Here, you're stuck. Goodbye now." Keeper of the Hall: "Insolent necromancer! The Far Shores is no prison in which you can place your enemies! You dare to come here and then expect to leave freely? I think not." Keeper of the Hall: "You though, are no less a fool. An honorable fool, but a fool nonetheless. Hm. Very well, though. I have an offer: slay this wretched woman and you and your liege can return to the Mundus." Septima Tharn: "I'll leave whenever I damn please … but I'll enjoy teaching you both a lesson in power first." Once Septima is defeated, King Emeric's soul will be freed but he will doubting himself after Septima's words. "Well, that was demoralizing, wasn't it? "Your death matters little, Emeric." I can't believe she said that! I don't know though. Is it true?" Of course not, Your Majesty. The Daggerfall Covenant needs you. "That's a relief … I suppose. There's some part of me that wants to stay here, but I'd have regrets for all eternity, wouldn't I? Since I am in the fortunate position of having a choice, I think I prefer you take me back." Of course. I'll take your soul back. After you reenter the living world, King Emeric's body will be surrounded by the mourning Queen Arzhela and the Lion Guard. When you release his soul it will appear as a mass of blue light while he attempts to reenter his body. High King Emeric: "There I am … still dead. So do I just climb back in …?" High King Emeric: "There. Easier than I thought. That knife wound still smarts, but it's good to be alive." King Emeric can then be spoken with. "That was an experience I won't be forgetting anytime soon. I'd say that you went beyond the call of duty, but I think you went even beyond that. Of course, Septima was actually after you, wasn't she?" Yes. We're both lucky to have survived. "I suppose so. Furthermore, I'm grateful now that Septima never returned my affections. Mara's mercy, that woman did not age well! She's irrelevant now though, thanks to you. I suspect, however, that we can't afford to rest on our laurels just yet." If he is spoken to after completing this quest or starting Messages Across Tamriel from him, he will mention that he is heading back to Wayrest. "Truthfully, I think a few days rest are well-deserved on both our parts—not at the seashore, mind you, but perhaps in Wayrest. Unfortunately though, I am long overdue for an appointment. And as it happens, so are you." If don't have this quest from Vanus Galerion or have already done it in another faction, you can start it from Emeric. 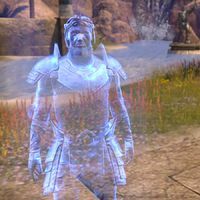 Later you will have to speak with King Emeric to convince him to parley with the other alliances to invade Coldharbour. Queen Ayrenn: "We must put aside our differences and work together or this assault is doomed from the start." High King Emeric: "How do we know this isn't a ruse? A clever plan to divert out forces while your armies take the Imperial City?" Jorunn the Skald-King: "I thought backstabbing was your favorite tactic, Emeric!" Queen Ayrenn: "Please! Are you both so arrogant? Your weapons are children's toys compared to the horrors that Molag Bal commands!" High King Emeric: "I will not wager the future of my people on the word of snow barbarian and an adolescent female. I fear for Tamriel's future if either of you were to sit upon the Ruby Throne!" Jorunn the Skald-King: "Since when do you care about your people? You never lift a finger except to count your gold!" Vanus Galerion: "Please, my lords! This bickering is pointless!" Jorunn the Skald-King: "What a waste of time!" Queen Ayrenn: "Obstinate fools, both of you!" High King Emeric: "What a mess. Apologies, Vanus, but I'm going to check on my Lion Guard." In the end, all three leaders retreat to their camps. After you convince Vanus of your idea to get the Guilds permission to fight, you can head to High King Emeric to see if you can convince him. His reaction to you will depend on your alliance. If you are part of the Covenant, he will listen to your suggestion very easily. "This meeting feels like two wolves and a sheep discussing what to have for dinner. I will not sit back and let them pick at my bones!" "That's more than I'm getting from them. What do you suggest?" Send the guilds into Coldharbour. "I don't doubt their commitment or their bravery, but they are few and Molag Bal's followers are legion." Do we have a choice? I don't see any other options. "All right, then. I'll agree, provided you can convince the barbarian and the child queen. I don't envy you the task. They're more pig-headed than I am!" When the Daedra have been repelled, Vanus Galerion and Countess Hakruba will call out to the leaders, trying to convince them that there is no more time to waste. Vanus Galerion: "Honored leaders! You have seen the face of our enemy!" 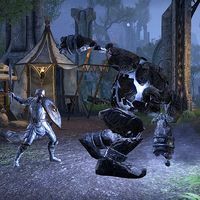 Vanus Galerion: "Molag Bal threatens every living being in Tamriel! The Mages Guild and the Fighters Guild have agreed to join forces to launch an assault on Coldharbour!" Countess Hakruba: "Trust in us! Sanction our actions! Give us your blessings! We will not let you down!" High King Emeric: "Vanus is right. The Guilds are our best and only choice. Send them to Coldharbour!" Jorunn the Skald-King: "I hate to admit it, but I agree with Emeric." Queen Ayrenn: "As do I. It appears that much of the distrust between out alliances was sown and nurtured by the God of Schemes." Countess Hakruba: "Molag Bal thrives on deception and chaos, but if you'll forgive me, this Alliance War is of your own making." Vanus Galerion: "Countess Hakruba. Gather the surviving members of both Guilds in the Stirk Interior. The champion and I will go there new to open the portal." Countess Hakruba: "We'll be right behind you, Vanus." Vanus Galerion: "The time has come, Champion." Before you leave, if you speak with Emeric he will say, "Molag Bal has much to answer for. Remember those who gave their lives today." High King Emeric is voiced by Bill Nighy. High King Emeric and Emeric, Covenant King are cards in Legends. This page was last modified on 10 April 2019, at 01:45.